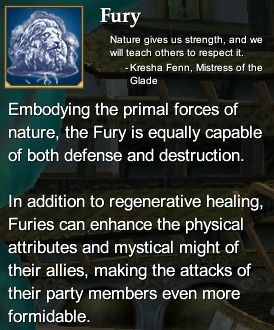 From the Everquest 2 player manual: Those who seek to harness the feral and destructive forces of nature will find the Fury to be a suitable profession. Although the Fury conjures his power from nature's ferocity and is a druid of predation and vengeance, he can play a vital support role in the party by providing magical healing and protection. The Fury can enhance his allies physical attributes and abilities in combat, and bring down destructive forces upon his enemies. Fury Epic Weapon Series (80) - Rise of Kunark Fury Epic Weapon. This page last modified 2011-08-25 22:53:02.